With the winter months rapidly upon us, the county-wide campaign to raise awareness of how ‘self-care’ can positively affect your wellbeing continues to promote messages about making healthy lifestyle changes. Aimed at people of all ages across Leicestershire and will be raising awareness on topics such as diabetes, healthy eating and high blood pressure. 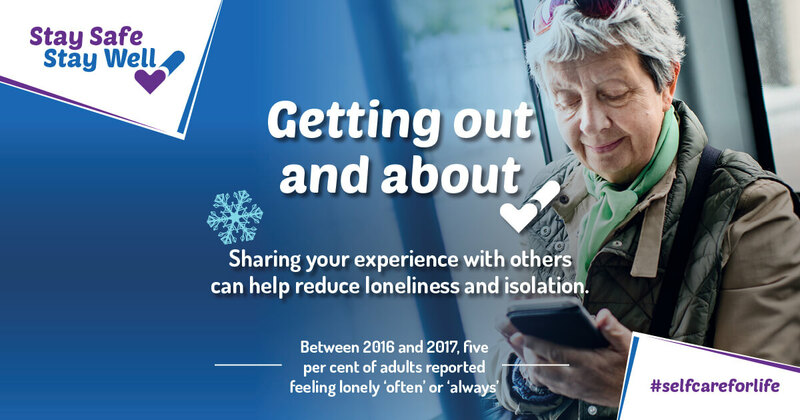 The promotion of ways to reduce feelings of loneliness and isolation is also a key element of the campaign from the county’s Health and Wellbeing Board. The statistics show that more than 37,000 adults in Leicestershire have diabetes. There are also over 100,000 people in Leicestershire registered to have Hypertension (high blood pressure). Both of which can be avoided with a healthier lifestyle and diet. Feelings of isolation and loneliness can affect people at any age. For example over 49,000 people aged 65 and over are currently living alone in Leicestershire. During the winter months, with temperatures dropping, feelings of isolation and loneliness can start to increase. Through social media, we will signpost where people can access advice and information. We will also encourage people to look at the things they can do every day, to support their health and wellbeing this winter and feature a number of seasonal themes focusing on keeping both body and mind healthy and active. Information and support on self-care will be shared throughout the winter period and to support people in improving their health and wellbeing now and preventing illness further down the line. Find local activities near you to help you get active your way! Feeling isolated and need to find health, social care or other local support?